With Akshaya Tritiya around, retail gold jewellers are expecting a strong demand similar to that witnessed during the Gudi Padwa. 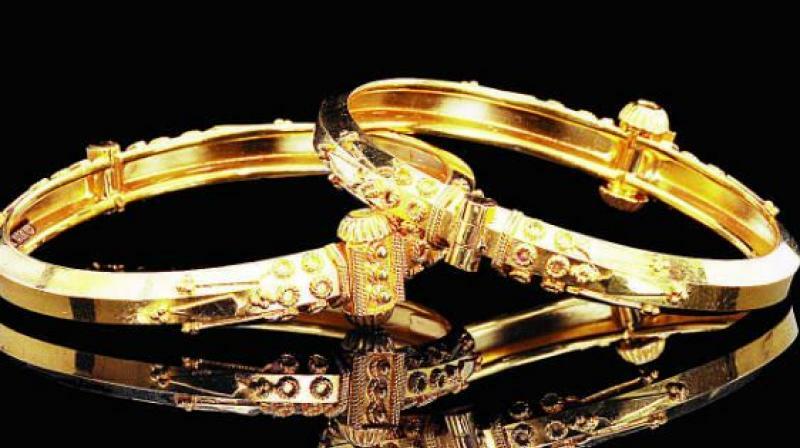 Retail gold jewellers are expecting a 10-15 per cent growth in demand during Akshaya Tritiya. New Delhi: While the sharp appreciation in the Indian rupee over the past few weeks has limited a major upside in the prices of domestic gold, concern over the escalating geo-political tension and rise in demand during the upcoming Akshaya Tritiya are expected to firm up the prices of yellow metal in the domestic market. The prices of gold in the global markets soared to a five-month high after the US launched a surprise missile strike on a Syrian Airbase and also dropped the largest non nuclear bomb in Afghanistan killing more than 30 ISIS militants. However, a 5 per cent appreciation in Indian rupee against the US dollar capped a major upside in the domestic markets. “I do think that gold prices could correct in the near term if tensions cool down. With the US Federal Reserve expected to raise interest rates going forward, there are chances of further price correction. But at the current moment of elevated political tensions in North Korea and Syria, I do see gold continuing its safe haven appeal in the short-term,” said Prithviraj Kothari, director, RiddiSiddhi Bullions. The gold in the domestic market is now trading around Rs 29,500 per 10 gram. With Akshaya Tritiya around, retail gold jewellers are expecting a strong demand similar to that witnessed during the festive occasion of Gudi Padwa. “Gold imports have soared to more than $400 billion by March, which suggests that dealers and traders have replenished their stocks to meet festive season demand,” noted Mr Kothari. “The impact of demonetisation has started fading and business has returned to normal. Gudi Padwa too had a good response. Last year, the gems and jewellery industry has seen a lot of ups and downs and thus this Akshay Tritiya is something that the entire industry is looking forward too. We are hoping for a good gold run this year on Akshaya Tritiya. Since it is coming on a Friday, we are expecting the festive spirit to continue right upto Monday and are hoping for a 10 –15 per cent rise in footfalls,” said Samir Sagar, director, Manubhai Jewellers.